Get the most bang for your Halloween decorating budget when you put a personalized Halloween doormat on your front step. It's the one place that all of your guests will be. Personal Creations has designed several family-friendly Halloween mats that will make guests of all ages feel welcome. 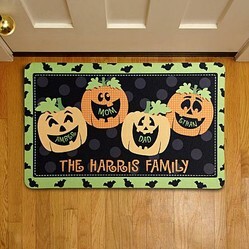 You can choose from the Pumpkin Family Doormat, Half-Round Pumpkin Doormat, the Smiley Candy Corn Doormat, the Pumpkin Patch Doormat, and the Scarecrow Happy Fall Family Doormat. Children love seeing their names and they will love being includes in this Halloween doormat. The durable doormat is as functional as it is attractive. It has a polyester front and non-slip rubber backing. Six pumpkins can fit on it and each pumpkin name can contain up to 9 letters. The jack-o-lanterns are definitely ready for Halloween with their bat-shaped mouths. There are smaller bats flying around the light green outer border. However, it's not so over the top Halloween, that you have to take it up the day after Halloween. It is subtle enough that it will give you time to put out your Thanksgiving or holiday doormat. Click here to buy the doormat or learn more about it or buy it from Personal Creations. Some parents prefer not listing their children's name for strangers to see. Kids will still get a charge out of the bright orange pumpkin face with the family name in the mouth. The playful green stem adds more visual interest. This personalized doormat measures 25 inches long and 17 inches tall. The family name can have up to 12 characters. It has a slip-resistant back to minimize any slips or falls. The front is long-wearing polyester and can be easily washed with soap and water. You can count on having this part of your Halloween decorations for years to come. Click Here to learn more about the product or to purchase it from Personal Creations. Some parents want their children to participate in the celebration of the Autumn Harvest but not Halloween. This Happy Fall personalized doormat allows everyone to be included. Even families that celebrate Halloween could enjoy a more general doormat that would be appropriate from Labor Day to Thanksgiving. In fact, it doesn't have to say Happy Fall. Families can choose any welcome up to 16 characters. Up to six scarecrows can be included with names up to nine characters. Click Here to learn more about this festive fall doormat on sale at Personal Creations. This smiling candy corn doormat will make all your friends and family members smile as they visit your home. I know that I love candy corns and I don't wait until Halloween to eat them. 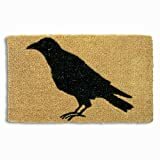 I would suggest that if you opt for this cheerful personalized doormat, that you have a bowl of candy corn waiting inside the door. That will make them smile even more! You can choose one line of text that has up to 22 characters in it. This candy lover might add "Bon Appetit!" On the practical side it has a non-slip backing to keep everyone safe and it is easily washed. It measures 33 inches long and 22 inches tall. Click Here to learn more about this product selling now at Personal Creations. Every cat lover knows that black cats bring good luck and lots of love. It's sad to think that they have a hard time in animal shelter because of an undeserved reputation. If your family has a black cat, they celebrate them at this time of year. The top line of the personalized doormat can say anything up to 25 characters. The cat family can contain one or two parent cats and up to 4 child cats. Halloween mat measures 27 inches across and 17 inches tall. If you don't want to put your child's real name on the outside of your home, then they can pick Halloween names or nicknames. Click Here to get more information or to purchase it from Personal Creations. Great inventory of creepy and bloody Zombie props for your home and yard. Zombie gravestones, Zombies hanging from trees, Zombie hands and other body parts. Fabulous selection of primitive wreaths for Halloween featuring grapevine wreaths and lots of spooky embellishments such as crows, witches, ghosts, and scarecrows.